The hermits are tropical and subtropical hummingbirds. The hermits differ from most other hummingbird species in that the color of their plumage is typically brown, rufous, green and grey; and other than a slight sheen, they generally don't have the iridescent plumage of hummingbirds. Additionally, whereas male and female hummingbirds look quite different in appearance, with hermits, the physical gender differences are far less pronounced. 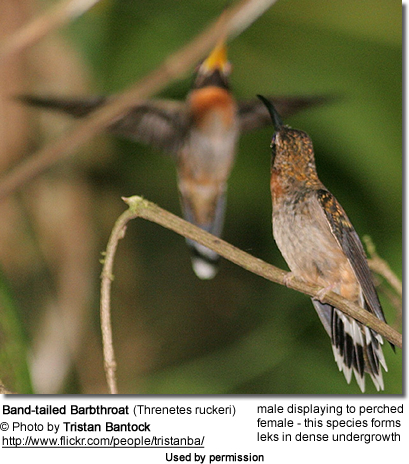 Most species have long, decurved bills - except the Koepcke's Hermit (Phaethornis koepckeae), Needle-billed Hermit (Phaethornis philippii) and Straight-billed Hermit (Phaethornis bourcieri), which have literally straight bills) . 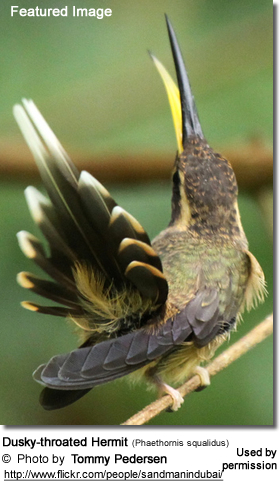 The Phaethornis genus hermits have a long decurved bill with a red or yellow base to the lower bill. The bill has evolved to fit perfectly into long, trumpet-shaped flowers, allowing them access to nectar that other species cannot reach. They have two long central tail feathers, tipped with white, buff or ochre. The top of the head is flat and they have a dusky facial mask with two pale facial stripes. Males and females look alike, with some small differences in bill or tail shape, and depth of plumage color or pattern. They are endemic to southern Mexico, through Central America, to South America as far south as northern Argentina. Most inhabit the forest edge or forest undergrowth and woodland areas. 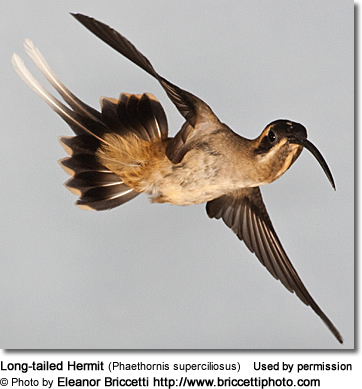 However, some species, for example the Planalto Hermit), favors more open spaces. In most hermit species, males form leks (= competitive mating displays) during the breeding season to attract females. Their display may entail wiggling of their tails and singing. Willing females will enter the area for the purpose of choosing a male for mating. Oftentimes she will choose the best singer. Hummingbirds in general are solitary and neither live nor migrate in flocks; and there is no pair bond for this species - the male's only involvement in the reproductive process is the actual mating with the female. He will separate from the female immediately after copulation. One male may mate with several females. In all likelihood, the female will also mate with several males. The males do not participate in choosing the nest location, building the nest or raising the chicks. 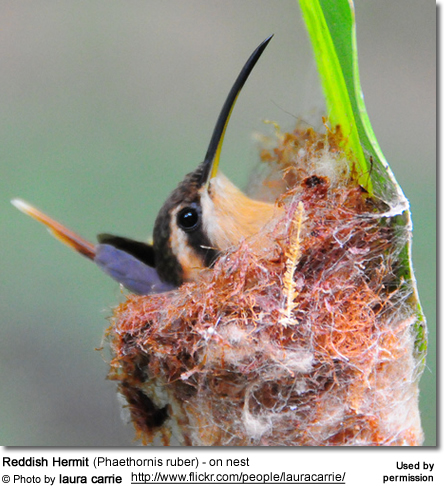 The female is alone responsible for building the remarkable cone-shaped nest which hangs by a single strong string of spiders' silk and/or rootlets from some overhead support, which could be a branch or the underside of the broad leaves of, for example, Heliconia plants, banana trees or ferns about 3 - 6 ft (1 - 2 m) above ground. However, these unusual nests have been found beneath bridges, in highway culverts and even hanging from roofs inside dark buildings. The nest is often near a stream or waterfall. It is constructed out of plant fibers woven together and green moss on the outside for camouflage in a protected location. She lines the nest with soft plant fibers, animal hair and feather down, and strengthens the structure with spider webbing and other sticky material, giving it an elastic quality to allow it to stretch to double its size as the chicks grow and need more room. The average clutch consists of two white eggs, which she incubates alone, while the male defends his territory and the flowers he feeds on (although hermit males tend to be less aggressive than the males of other hummingbird species). The young are born blind, immobile and without any down. The female alone protects and feeds the chicks with regurgitated food (mostly partially-digested insects since nectar is an insufficient source of protein for the growing chicks). The female pushes the food down the chicks' throats with her long bill directly into their stomachs. As is the case with other hummingbird species, the chicks are brooded only the first week or two, and left alone even on cooler nights after about 12 days - probably due to the small nest size. The chicks leave the nest when they are about 20 days old. Hermits primarily feed on nectar taken from a variety of brightly colored, scented small flowers of trees, herbs, shrubs and epiphytes. Most hermits are associated with heliconias, but will also feed on other nectar sources, such as the flowers of Centropogon, Passiflora, Costus. In general, they favor flowers with the highest sugar content (often red-colored and tubular-shaped). 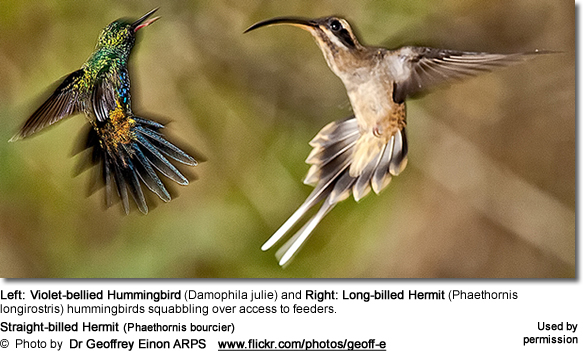 They are "trap-line feeders" which means that they visit plants along a long route (in this case of up to 0.6 miles or 1 km) - as opposed to most other hummingbird species who are highly territorial and will aggressively protect, those areas containing flowers with high energy nectar. 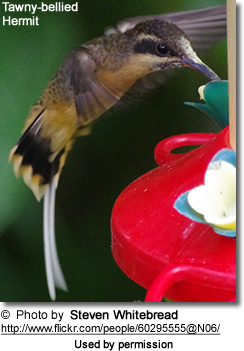 They use their long, extendible, straw-like tongues to retrieve the nectar while hovering with their tails cocked upward as they are licking at the nectar up to 13 times per second. Sometimes they may be seen hanging on the flower while feeding. Male hermits are generally less aggressive than other male hummingbird species, however, both males and females will defend a feeding territory.